Christians from different churches and Ed leading in a time of prayer after he taught a Bible study in Kwidzyn, Poland, in September 2004. Ed Kleiman, a Messianic Jew, grew up in St. Louis "worshipping & serving the god in the mirror" as he refers to it. From the age of sixteen to forty one he offered up daily sacrifices to this god; of drugs, alcohol, and sexual immorality. Then God granted him repentance (Acts 11:18), and God's gift of eternal life by grace through faith in Jesus Christ alone (Ephesians 2:8), on October 23rd, 1994. The pastor of that church who was used to proclaim the gospel of God's grace, which is the power of God for salvation (Romans. 1:16), met to disciple Ed every week for the next 2 years and 8 months, until he was called to pastor another church in another state. Sometime after, Ed began attending and auditing classes at Covenant Theological Seminary. He preached for the first time on November 16th, 1997 at a retirement home. 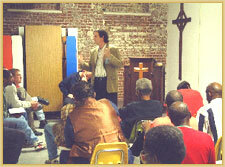 In the beginning of 1999 he began preaching at Sunshine Mission, a homeless shelter in St. Louis (shown at right). There for over the past thirteen years Ed has preached well over a hundred and twenty times, and seen God grant new life to some of the most down-&-out, through their trust and faith in our Lord Jesus Christ. In 2000, he became part of, and now serves full time with the missions organization, International Messengers. On September 11, 2001, ten minutes before Ed, or anyone in his office heard about the World Trade Center, he gave notice where he worked, saying the Lord had opened so many doors of ministry that he believed He was moving him on. Ed needed to pursue full-time the ministry God had already given him: calling His people to once again humble themselves and pray; and say why it was so important to do so now! The Lord will raise up people to get us to no longer trust in ourselves but in Him alone (2 Corinthians 1:9). In 2002, Ed ministered in 15 different churches in six different states and two different countries, leading prayer initiatives and teaching on prayer. Four times a year now he teaches new missionary students in Libby, Montana at the Training Center for International Messengers. In that year alone he taught 20 different missionaries before they went to places in Poland, Hungary, Romania, the United States, Germany, Slovakia, and the Ukraine. Like all great historical revivals in the past, prayer continues to be a crucial, and still often missing element. Our gracious Lord has been using Ed, also expanding opportunities and opening doors to preach on the importance of the local church, God's design for the family, especially the role of men, the call for missions, while always emphasizing the power, priority, and purposes of prayer. 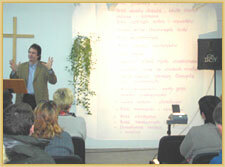 The photo at the right shows Ed speaking to the missionaries at International Messengers Staff Conference in the fall of 2003 in Zakopane, Poland. 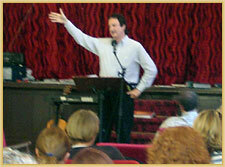 Ed went on to teach and minister in several other cities in Poland, Romania, Hungary, and Slovakia. In 2004 Ed ministered in nine different cities throughout Poland and spent a week teaching nationals who were the new missionary students at the Missions School in Odessa, Ukraine. 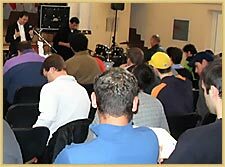 In 2005 he did his first, of several Men's Conference in Romania. Please continue to pray for this important ongoing work! The Lord has used it to rekindle a passion for Jesus Christ in many churches throughout the United States as well. Ed Kleiman believes in the sufficiency of Scripture and prevailing prayer because he has been transformed by the power of both. Less than two weeks before placing his trust in Jesus Christ and His finished work on the cross, and in His perfect righteousness, his friend who invited him to church told the pastor during a meeting he felt his friend (Ed) was "ripe" or ready. The pastor stopped the meeting and prayed for Ed's salvation and for God to grant him eternal life, and within two weeks God answered that prayer. Influenced much by the heroes of the faith who've gone before him, Ed would say with them; nothing less than sovereign power and irresistible grace would ever be sufficient for such a one as myself! None need despair, since He has saved such a worthless, hell-deserving one as me! We must at all times, in all ways, with all people, point them to Christ! 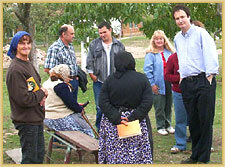 The above photo shows Ed with a group at the end of their one and only prayer walk, in a small village in Romania. During that prayer walk they shared the Gospel with an older man who came up to them saying he was drunk, one woman came to them asking for a Bible (pictured holding looking at the camera), and an elderly woman on two crutches also came up to them and asked for prayer (pictured sitting on the bench), and as they prayed, she wept. Ed went on to say; "Not bad for the first prayer walk." The photo above shows Ed in Radom, Poland asking the question to those in the only five evangelical churches in the town; "What would this city look like if Jesus Christ made His rule and reign over every aspect of it clearly known and visible to all?" They then went on to begin to pray for those things.